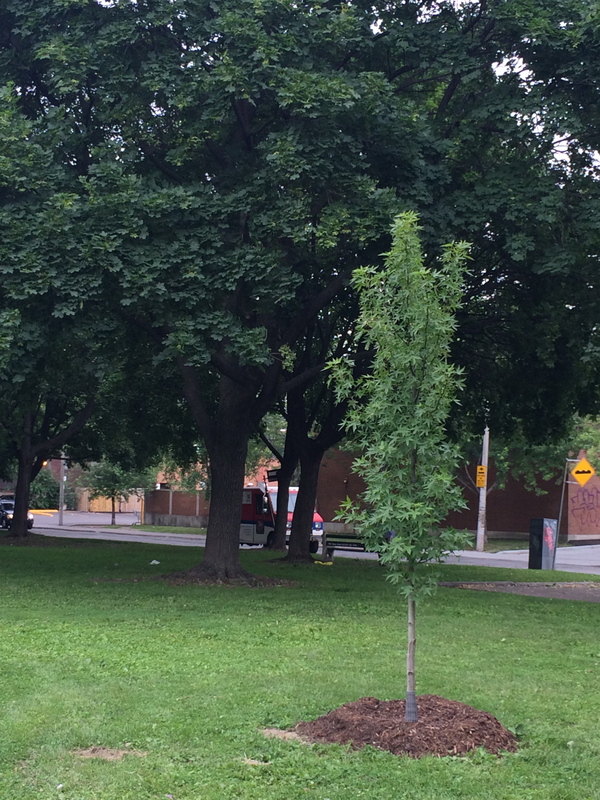 City of Toronto’s Natural Resource Specialist Lisa McLean reached out to FoRRP to let us know they have replaced 5 of the 18 trees originally planted in 2013 that did not survive. They added one additional tree, pruned, straightened & mulched some others. Interestingly, of the 5 trees we lost, 3 were never adopted! We now have 8 trees currently in need of adopters. Please consider getting involved and caring for 1, 2 or more of these saplings. It will only take a small amount of your time, and the benefits to your neighbourhood are huge. For more information or to sign up, please contact me at jill@roxtonroadparks.com. Through City and volunteer efforts 39 trees have been added to Fred Hamilton and George Ben Parks in the last 2 years! We want to continue adding more trees to the parks and add diverse species for a beautiful and healthy canopy in the future. Follow the link below to see our Friends Tree map currently listing all our new trees, their adopters, and their species. We also want to add more content to the map. If you have a story about your tree please share and we will add it to the map. Thank you. Click here to see a google map with all new trees including those needing adoption! I will help the London Plan in George Ben. I will care for the London Plane tree in George Ben. What next? Hi Len, Thanks for offering to look after one of our trees. Those in George Ben Park are particularly in need! If you can email me at jill@roxtonroadparks.com, I will send you the instructions!